The greatest skateboarding game, period. 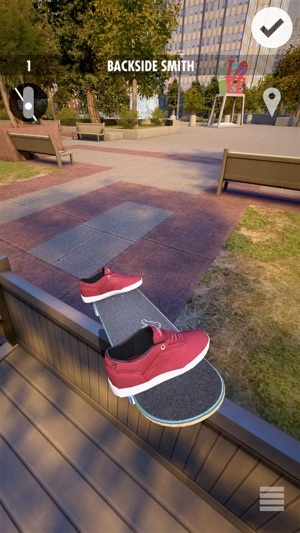 Use the touch screen to directly control your shoes and board. 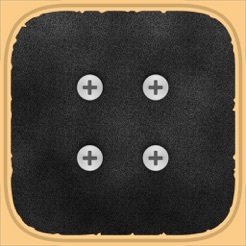 Controls have been carefully designed to highlight the things that are most fun and important in actual skating, with a strong focus on flow of tricks and runs. 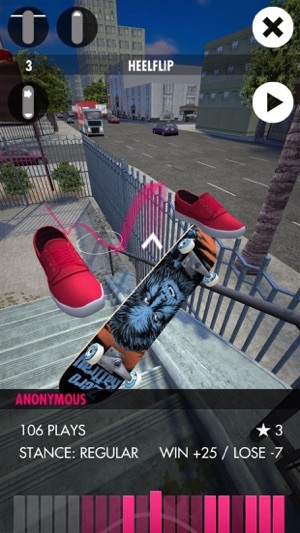 This is the first touch-based skating game to include the full range of street tricks. Jump from Ollie, Switch, Fakie and Nollie and perform all standard flip tricks; with the inclusion of body rotations you can even do tricks such as Front-Side Flips and Big Flips. With recent updates now including Late Flips, Reverts, Ghetto Birds, Impossibles, Dolphin Flips, Dragon Flips and Gazelles. Chain everything together with manuals, nose manuals and every kind of grind and slide. Skater allows you to save your favourite trick runs and share them with the world. In turn, you get to discover and copy runs that other players have created – giving you access to an endless feed of new ideas to explore. Pick from the latest shoes and decks to skate with; DC Shoes, Revive, DGK, etnies, Emerica, éS, Foundation, Lakai, Toy Machine, Zero, Baker, Deathwish, Shake Junt, Amgrip, Spitfire, Thunder, Venture, Pig Wheels, Force and Bro Style – they are all already included in the game. The spots featured are El Toro, Carlsbad Gap, Hollywood High, Stoner Plaza, Camp Woodward, Love Park and The Berrics – with even more to come in future updates! Starting with architectural plans, height maps and photos we took on-site, every detail of these legendary spots has been faithfully recreated – down to the graffiti, street signs and even stickers on obstacles. Go skate at some of the most famous spots in history with content from thousands of players from around the world – any time you want! Questions or feedback? Hit us up on support@skaterapp.com. 1.6.2 - KTPlay Community Section and New Baker Decks! - Removed several causes of lag and jitter in gameplay. Feeling very buttery on older devices like iPad Mini 1! I skate on the daily so I decided to get a good skate game to play. I had a similar game that I liked very much but ended up doing everything on it so I wanted a new challenge. Great graphics, I mean really quality graphics for a mobile game. They make you do a long tutorial which I had to do twice because my game crashed in the middle of it. The controls were hard to get used to at first. I thought it would be like a virtual tech deck, but you use your thumbs to control the board which I thought was a little odd. I like being able to use company boards, but I wish you could change stuff like wheels and trucks, but you can only get pre picked decks. Not a big deal but just a thought. After playing for a while I did get bored, so this is where my title fits in with my review. This game is fun for awhile but gets dry after 15 minutes. I wish they changed up some options and made different game options that could spice up the gameplay. Sorry for writing a book but this game is NOT worth 5 dollars, at the most it's worth $2 for the lack of gameplay and crashes and lagging. 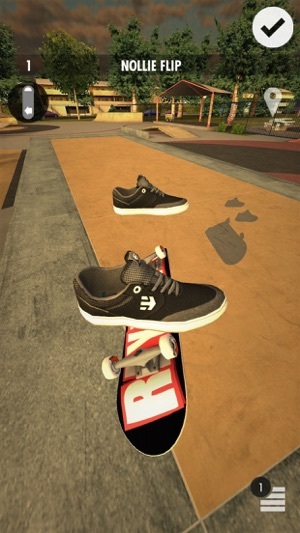 True Skate definitely has more features and parks, but when it comes to a skate game where you actually have control, Skater takes it for sure. True Skate isn't fun because it's nearly impossible to play, but with skate you have so much more control over your board that it makes it so much more fun. 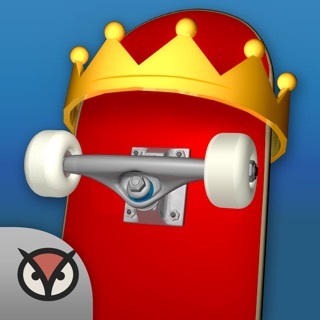 Yeah True Skate may have more spots (which is one of the downsides of this game - it definitely lacks content), but you'll have more fun playing this game with the little spots you have rather than spending hours on hours trying to land a trick on True Skate and it's many spots. Overall, this is a solid skate game. A bit hard to get used to in the beginning, but once you get the hang of it it's extremely fun. It lacks content and spots which makes the game really boring and the developers don't do enough to update its users with news on what's going on which gets frustrating, but I'm sure they're adding some good stuff. This game is fun and enjoyable nevertheless and worth the money.